Well the B got through the MOT but got a stern advisory on the rear brake balance. 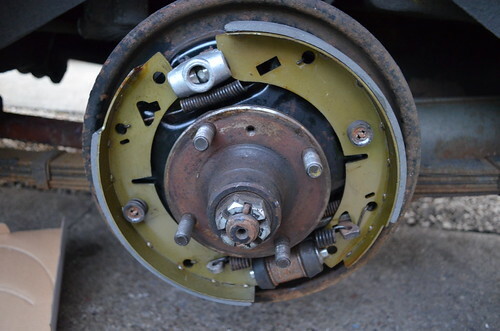 I'd suspected this would happen, so had pre-ordered a brake refurb kit and had intended fitting it before the MOT but having got a red-eye flight back the day before, the anticipated day of fettling was spent catching up on sleep. However it did mean that I could get stuck in just after getting back from the garage. I'd be replacing the adjusters as the old ones were stuck solid, and the shoes too. The kit came with new boots for the handbrake connections so I'd put those in too. It'd been a while since I'd taken the rear brakes apart but soon remembered all the pain points - especially getting the anti-rattle springs back on! But the easiest way to take it all apart is still to pull one shoe out to relieve tension on the springs. The adjusters came out really easily - just two bolts at the back and a slight tap. Use of a rubber band held the pistons in place on the new adjusters while I fettled the rest of the assembly. Once everything was back in place I backed the adjusters right off, put the drum back on, then tightened it back up until the brakes just started to bite, then back a touch. Giving the brakes a couple of pumps to re-sit the shoes and the rears were back up to snuff. Will pop it down to the garage to check out the results and make any minor adjustments.